It’s time for a break from the narrow, busy alleyways of Fez el Bali, and the gardens of the JNANE S’BILE [open from 8am] are just the ticket. From Bab Boujeloud, walk away from the medina, across the open square of Place Baghdadi and through the gateway to Avenue des Français; the main entrance to the gardens is about 150m along the road, on your left. They’re a far cry from the medina, with shady pathways and little waterways running past slender cypress trees, colourful myrtles, bamboo forests and a variety of cactus plants. As Fez’s only real green space, this is also a popular place for Fassi families, who like to stroll around the lake at the bottom of the gardens. From the Jnane S’bile, head back towards Bab Boujeloud and take any of the lanes on the right, just before the gate, to Place Batha. On the other side of the square, steps on the left lead to Sidi Lhakhayat. Follow this alleyway into the medina for about 500m or so, ignoring all the little side lanes, until you get to a kind of T-junction. Turn left here and you’ll shortly come to the PALAIS EL GLAOUI [open from 2pm | 25dh], a nineteenth-century palace that once belonged to the infamous T’hami el Glaoui. Still very much a working home, this is a museum with a difference, and a great place for children to let their imaginations run wild – with its unassuming entrance and run-down rooms full of faded glory, you’ll have the feeling that you’re unearthing a long-forgotten treasure. 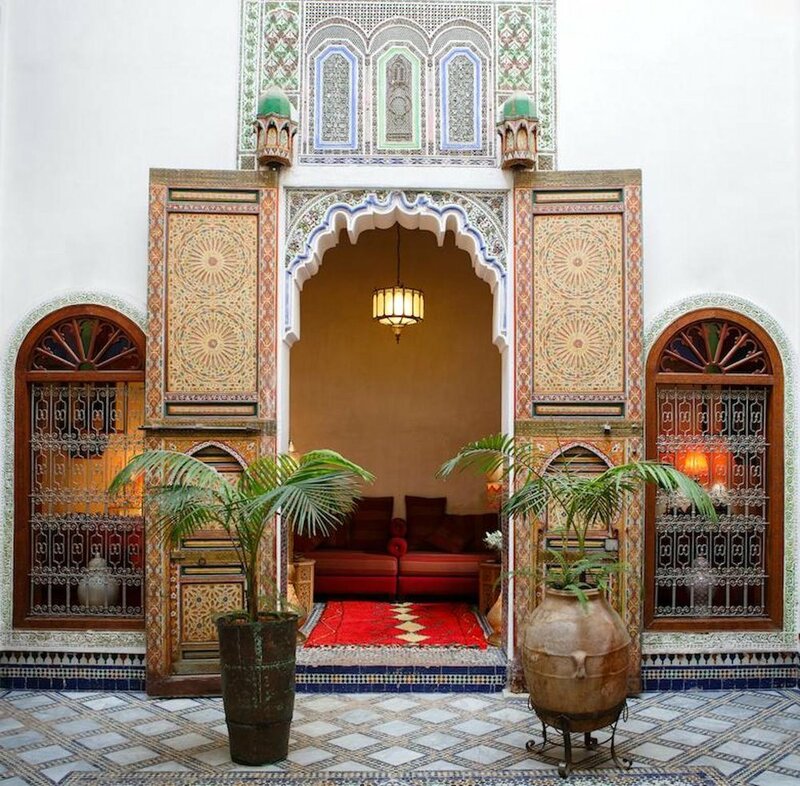 One of the women who lives here will guide you round the rooms, explaining the stories behind them and telling tales of the former owner who thought nothing of displaying the heads of his enemies on the gates outside Marrakesh. A trip up to the fourteenth-century MERENID TOMBS, which occupy the hillside just north of Fez el Bali, is the perfect end to the day. There’s not much left of the tombs themselves, but it’s a great place for a run around after the confines of the medina and you might even see some shepherds tending their flocks up here. More than that, though, the views down over the Muslim cemeteries and the medina below are superb, whilst the sound of the muezzin reverberating across the rooftops, as every mosque in Fez takes up the call to prayer, will send shivers down your spine. Petits taxis run up here and back from Bab Boujeloud. TOP TIP Fez’s artisans are the finest in Morocco, so where better for your kids to pick up a few vocational skills? At the courses run by Craft Draft, they can try their hand at sacred art (2 hours | 100dh), weaving (2 hours | 150dh) or embroidery (3 hours | 200dh | over 9s only), or they can join one of the regular drop-in workshops on brass etching and have a go at engraving their own Moroccan tea tray. This relaxed restaurant in the laneways south of Talâa Seghira occupies the pretty little gardens of Riad Idrissy and is run with the same style and affection. For children, their Moroccan tapas are a good way of sampling several bite-sized dishes instead of committing to a single main, especially if they’re trying something new. Otherwise, the dinner menu normally includes soups, warm chickpea cakes, and mains such as beef and almond kefta (a tagine with an egg on top); or with advance notice, they can whip up a delicious pigeon pastilla, a speciality of Fez.